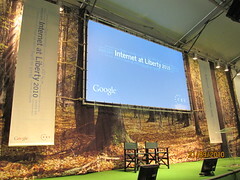 This past week Google hosted the first Internet at Liberty Conference in Budapest on “the promise and peril of online free expression”. The event brought together some of the smartest commentators and practitioners working on this issue around the world. Two of the participants, Jillian York and Leila Nachawati Rego, were kind enough to liveblog some of the sessions. Links to their posts are below. You can also search the Twitter back channel for the event at #IAL2010 and see some photos from participants Charles Mok and Claudio Ruiz here. Are We Compromising National Security by Increasing Access to Information Online?